In recent years the importance of evaluation within the Charity Sector has grown significantly. Increasingly, voluntary organisations are being asked to set out what they are trying to achieve and to provide evidence that they have achieved their desired outcomes. This evidence can provide assurance to funders that any grant awarded has been well used. It can also have an important role in helping projects to have a clear idea of what they are setting out to achieve and to ensure that the project then delivers that as well as possible. 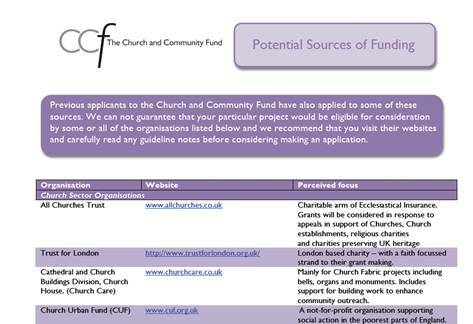 The Church and Community Fund requests that applicants think about what they are ultimately trying to achieve through carrying out a project and to specify this aim on the application form. This aim can then be broken down into a few clear objectives. Applicants should also think of measures which will help identify whether or not those objectives have been achieved such as the numbers of people volunteering, attendance at an event or changes in attitudes or aspirations to give a few examples. It may be appropriate to carry out some monitoring to see whether or not the project brings about changes in these measures. Church Urban Fund – Another important source of funding and information for church based community projects. Church Care – For further advice on converting church buildings for community use and a wealth of information on church fabric issues. The Church of England – Visit this site to find a wide range of information on the work of The Church of England. Copyright © 2019 The Church and Community Fund. All rights reserved.